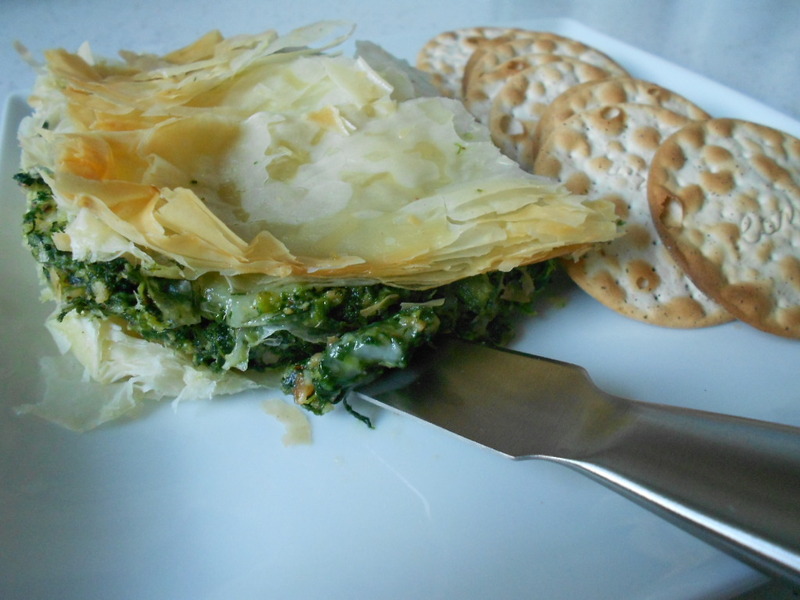 I ran out of fresh basil and improvised with chopped frozen spinach…Love this recipe! Combine all ingredients for the pesto in a food processor, blend and chop until smooth. If it looks too thick, add a little extra oil. Follow the instructions for the fillo dough, but basically, Gently brush the oil over each sheet or 2 at a time. Start with a layer of 6 or so, top with a spreading of pesto, top with thin slices of brie. Top with the pesto and then repeat the fillo sheets. Repeat the pesto and brie steps. Sprinkle this layer with a little garlic herb salt. Top with 5-6 sheets of fillo and then brush more oil on top. Bake on the middle rack in a preheated 375F oven for about 30 minutes. Ovens may vary, so watch carefully. Once it looks golden in color and is crispy to the touch, it’s ready! Slice it up and serve with water crackers.